From fine arts to mimicry, from GD to MUN, from Essay Writing to Cartooning, NR students have been participating in various competitions, and most of them have been winning. Have a glimpse of the winners of this year! Sabahat Contractor won the Best News Press Award in the Model United Nations organized by H.L. College of Commerce. Akash Jauhari of NRBBA won the third prize in the Group Discussion competition at ‘The Unassailable’, a national level festival organized by S K Patel Institute of Management, K S University, Gandhinagar. It is yet again a proud moment for NRBBA to state that this year we had 19 rankers in top 50 in Semester 1, 11 rankers in top 50 in Semester 3 and 3 rankers in top 50 in semester V! It is a matter of pleasure that the students are not only keeping up with the tradition, but also starting a new tradition, as this time, once again we have the 1st ranker in Semester 3!! Have a glimpse of our rankers. Bansuri Pandya bagged a prize among the best three in the Ellisbridge South Zone Youthfestival organized by Gujarat University. Vivan Mehta won a prize in the Newspress Category at Model United Nations organized by IIMUN Surat and AIESEC, Ahmedabad. Akash Jauhari proudly bragging his National level achievement. Akash Jauhri won the third prize in Group Discussion at a national level management fest – Unassailable – organized by Kadi Sarva Vishwavidyalaya, Gandhinagar. Sahil Minsariya basking in the glory of his achievement. 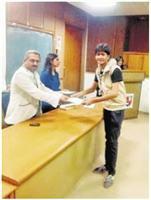 Sahil Minsariya won the second prize in the Rangbahar – Cartooning competition organized by GLSIC. Stuti Desai and Vinisha Ruparel with their creations and awards. Stuti Desai and Vinisha Ruparel won the First and the Third prizes respectively in the Greeting Card making competition organized by J G College of Commerce. Stuti Desai with her one among many prizes. 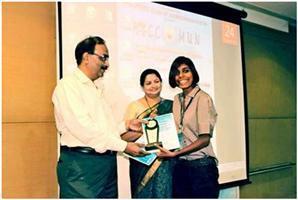 Stuti Desai won the second prize in the Rangbahar – on the spot painting competition organized by GLSIC. Vinisha Ruparel and Ishita Hindocha stepping towards the first prize in paper weaving. Vinisha Ruparel and Ishita Hindocha won the First Prize in paper weaving competition at Advent- Management Fest organized by KS School of Management. The NR Garba team won the First prize for the best Costume at Sports Club Garba Competition.